What ever kind of cover you fit to a tablet, it needs to hang on. This is the second version of Logitech’s space-saving and productivity-pushing keyboard cover, which we reviewed back in April. However, while it’s a much more refined typing experience, it’s just not got the grip necessary to act as a standalone protective cover. Weighing 223g (the previous version was 217g), the Logitech Ultra-thin Keyboard Cover for iPad Mini is nevertheless the best productivity gadget for tablets yet. The tiny keyboard is somehow a joy to use; this new version uses squarer, less rounded and slightly concave keys that are mottled matte rather than shiny. As well as being easy to type with, it’s also whisper-quiet. That’s a big improvement on the loud taps from the previous version. Not much has changed here, with the keyboard attaching to an iPad Mini via Bluetooth. Charged-up via micro USB, the battery lasted for two weeks of intermittent use in our test period. Once the keyboard and iPad have been paired via Bluetooth, they automatically join the second you move the switch on the side of the keyboard from red to green. Just make sure to turn it off after use to save the battery. Perhaps the biggest improvement on this incarnation is not the silent keyboard, but the new multi-angle support options. The first version had only one angle the iPad could sit-up in, and it was far too upright; it felt as if we were looking down at the screen rather than at it. In this new version, the entire gulley the iPad’s side sits in can – with a little pressure – tip backwards by a crucial few degrees. It makes the product much more pleasant to use, though you do have to push that angled gully down manually before you can use the product as a screen cover. That’s a bit annoying. Sadly, this new version has done away with the strongly magnetic spine right across the side of the far end of the keyboard, and replaced it with a narrower yet bigger – and much weaker – version. 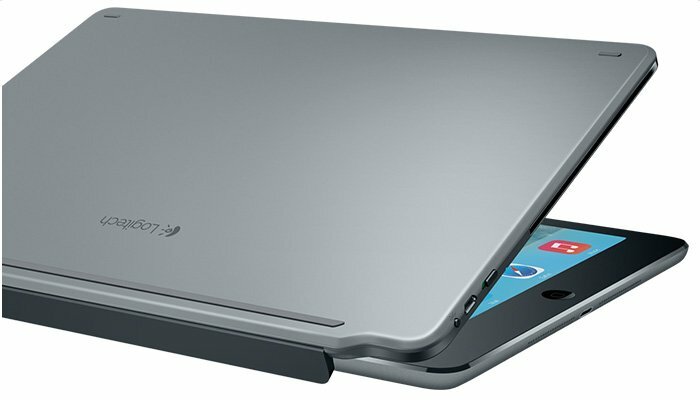 As you push the side of the iPad towards it, this spine rises to cling on to its guest device, but it’s a weak grip. Smoother typing and much better angled support, but this productivity gadget is let down by less than reliable spine attachment. However, so good is the keyboard as a productivity tool that TravGear is definitely packing in on the next work trip, albeit with some extra protection from a loose-fitting, padded iPad case in tow, too.